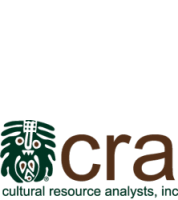 Indiana Office Recognized In Business Magazine | Cultural Resource Analysts, Inc. The Evansville, Indiana, office was recently visited by a reporter from the Evansville Business Journal. Although Cultural Resource Analysts, Inc., is headquartered in Lexington, Kentucky, the company operates numerous satellite offices working to preserve the past across the United States, including one in Evansville. The Evansville Business Journal featured Andrew Martin, Director of Operations for Indiana, and the Evansville office staff in their May 2013 issue. Jennifer Young, of the Evansville Business Journal, visited the office and shared with the magazine readers how CRA serves as an integral part of keeping the past alive.